ALTHOUGH the conditions present a slight concern, Ryley Major is expected to maintain his perfect record since returning from injury when he competes in Launceston tonight. Winner of his three starts from a 32-month absence, Ryley Major is engaged in the second Easter Cup heat for trainer Rohan Hillier. Rapt with the gelding’s form, Hillier’s main concern is how well Ryley Major will handle the standing start. The son of Art Major is one of four entrants to begin from the 10-metre mark, with his biggest threat – Victorian raider, War Dan – sharing the handicap. “As long as he steps he will be hard to beat,” Hillier said. “This is his debut from behind the tapes, but I don’t believe it will be a problem. “He seems pretty good at home, but it is always different on race day. “He’s the best horse I’ve ever had, and all going well, he should beat that field. 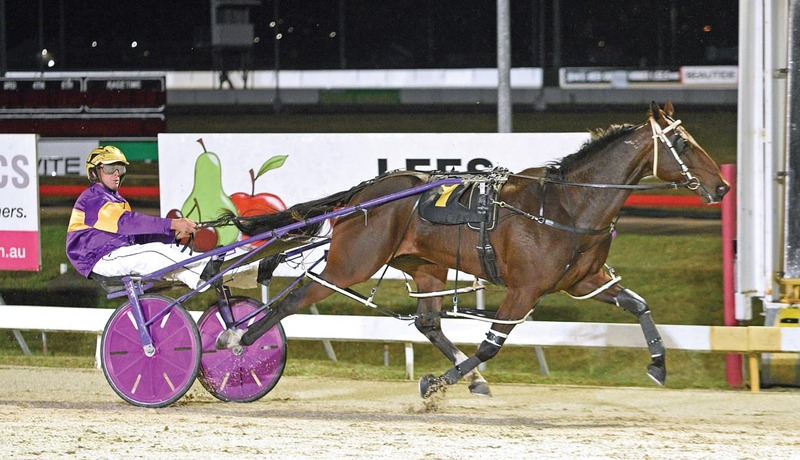 Runner-up behind Ryley Major in last week’s Launceston Mile, Harjeet is the one to beat in the opening qualifier. Looking to successfully defend his Easter Cup title, Harjeet faces a daunting task from his 30-metre back mark. Along with his handicap, Harjeet’s dangers include local star Scooterwillrev and Victorian visitor, Franco Tristan, with the pair to begin from the 10-metre line.